There are four great new brad designs - flowers, filigree, circles and stars - each design is normally $14.65 including 5% postage, for a total of 16 brads (eight of each size shown, plus 16 mini brads with the filigree design). If you are like me you want them all! The way this share will work is that each person will pay for just one pack of brads, with four people per share. You will then receive a mixed brad pack, with two of each design shown - a total of 16 designer brads, and the four little brads that come with the filigree brads. Of course, you will get the container to store them in too - that will make life easier! The Flower Fusion pack would normally cost $37.75 including 5% postage, for approximately 130 felt flowers. They come in 14 different flower designs, as shown, and a mixture of three colours - Pumpkin Pie (pictured), Rose Red, and Old Olive. Yum, yum, yum. The way that this share will work is that each pack of flowers will be divided between three people, with the cost also being shared between three. You will receive a bag of approximately 42 flowers - including each of the 14 designs shown, in a mixture of pumpkin, rose red and olive. (The tin is not included in this share, because, well, one tin between three just doesn't work). exactly the same as share #2, but with different colours. The felt flowers in this share are pink pirouette, baja breeze, and chocolate chip. 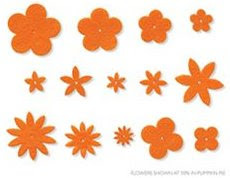 Flower Fusion Too has the same 14 flower designs (as shown above in pumpkin), and once again, you will get a mixture of all 14 designs, and all three colours - approximately 42 total. Oh, and just a little reminder - these shares are only open to people in New Zealand. Now I am hoping this all makes sense. My head is a little fuzzy today. It makes sense in fuzzy world, but if you have questions, please contact me. I will have some more shares coming soon, including ribbons and 'onboard' embellishments. I am thinking about designer papers too - but I prefer to keep those at 12 x 12 size as I think that is more versatile than a smaller sample, so still thinking on that one. Do remember you can easily organise your own shares for these though - just go halves with a friend!